When I first began growing orchids, one of my wishes was to have orchids in flower all year round but I soon realised that the leanest time of year was summer. But by observing other collections and the show bench during the summer months I was able to make a list of cool-growing summer-flowering orchids, many of them species. 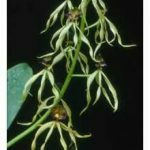 Some of the most charming flowers seen during summer are species of the genus Encyclia, particularly Encyclia mariae (syn. 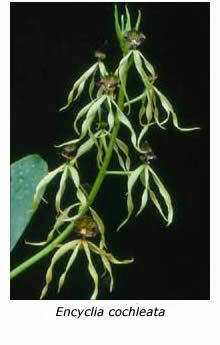 Euchile mariae) and Encyclia cochleata (syn. Prosthechea cochleata). Although E. mariae is a small-growing plant, its flowers are relatively large with yellowish green petals and sepals, and a white labellum. E. cochleata, another native of Mexico, flowers sequentially and each inflorescence may carry its flowers for nine months or even longer. 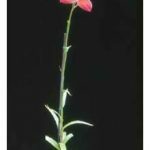 Three or four flowers are usually open at anyone time, the lower ones fading and falling while new buds develop at the top of the inflorescence. E. cochleata has narrow yellow sepals and petals, and a relatively large concave lip marked with purple, from which this orchid gets its popular name, the Cockle-shell Orchid. The three Australian cymbidium species, Cymbidium suave, C. canaliculatum and C. madidum, flower during late spring and summer, as do many of their hybrids. Other summer-flowering cymbidium hybrids include C. Peter Pan ‘Greensleeves’ and C. Golden Elf ‘Sundust’, both bred from the Asian species Cymbidium ensifolium. Unfortunately, hybrids bred from the above two primary hybrids tend to flower in autumn rather than in summer. Summer is the main flowering season for Disa uniflora and its hybrids but these orchids are more suited to the cooler climate of southern Victoria than to the consistently hot summer weather we get along the Murray River. Some zygopetalum hybrids flower during summer, although most of these are intergeneric hybrids bred from zygopetalums and related genera such as Promenaea or Colax (now called Pabstia). These hybrids are known as propetalums and zygocolax, respectively. One of the most spectacular orchids to flower during summer is the species Stanhopea nigroviolacea. It must be grown in a hanging basket because its large purple and yellow flowers, measuring over 150 mm (6 in) across, are carried on spikes that push their way down through the potting mix. The only drawback with stanhopeas is that their flowers last only three or four days (even less in really hot weather), despite their leather-like appearance. 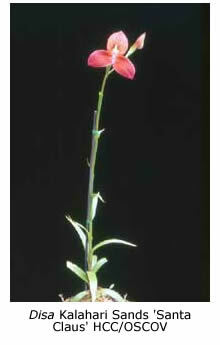 But don’t let that deter you – for three days your orchid will be the centre of attention for your family and friends. Most stanhopea species require intermediate or warm conditions but S. nigroviolacea, S. tigrina and S. wardii withstand winter temperatures down to freezing, if kept fairly dry at that time. Last but not least is another central American species, Lycaste aromatica. Although the books usually recommend intermediate conditions for this species, several Melbourne growers find that it grows well and flowers regularly each summer if grown in a ‘cosy’ shade house, with protection from rains and frost in winter. Each mature pseudobulb can produce ten or more greenish yellow, long-lasting flowers. By visiting orchid nurseries and other growers during summer you can find out about these and other summer-flowering orchids. Make a list and then seek out those you fancy from the sales bench at shows and orchid nurseries. Some of them may be hard to find but when you succeed you’ll discover that they give you great pleasure during the summer months.